Very exciting!!! I feel fortunate to have been able to work with such a well-respected magazine and to interview my friend Carol for this glimpse into her life and work as a designer. I first met Carol at Fibre Feis in 2011 when I was pregnant with LB. She shared wisdom from her experience as a mother without sounding off-hand about it and was reassuring. Our friendship was forged. She later came to my baby shower with her own design (Iceling Cardigan) knitted for LB. 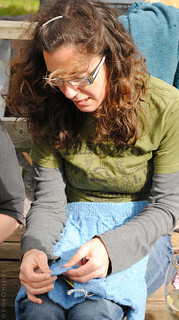 And the last time I went out knitting before LB was born, Carol taught me how to knit cables. Not that I’ve had much time to knit cables since then. But now I know. But none of that made it into the profile because it was about Carol and her work as a designer, not just how nice a friend she is. Though you can hopefully tell by reading it that she is kind, respected and intelligent. I tried not to use those exact words though. 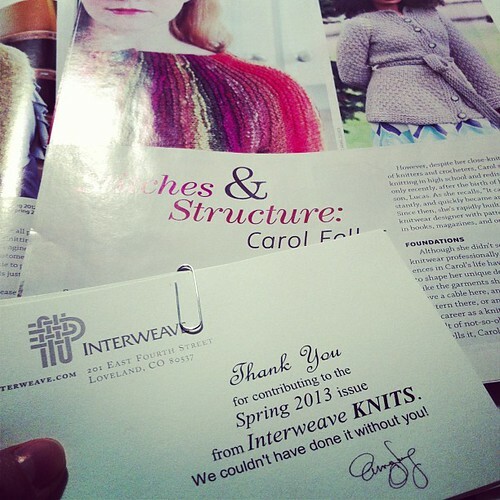 This entry was posted in Books | Read, Knitting | Crochet, My Life and tagged byline, carol feller, fibre feis, press.